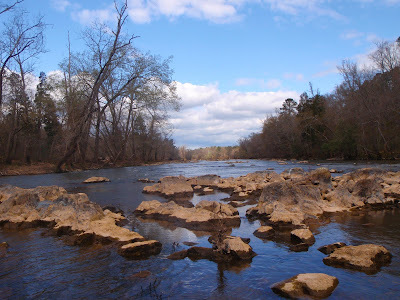 Now that spring is finally trying to get its foothold on the year, I figured it was time to check out my favorite stretch of the Haw River. Most folks are focused downstream, anxiously awaiting the white bass run, but I am more excited about the prospect of chasing big shoals largemouths again. I'm rapidly becoming a two fish fly fisherman, trout and largemouths, the very best North Carolina freshwater has to offer. While it still appears early for the bucketmouths, I did manage to pull a single fish from the middle of one of the few slow stretches of water that I could find. But if you only catch one, it might as well be a decent one - a nice 17-18" fish, slim from a long winter fast, but still carrying a good fight. 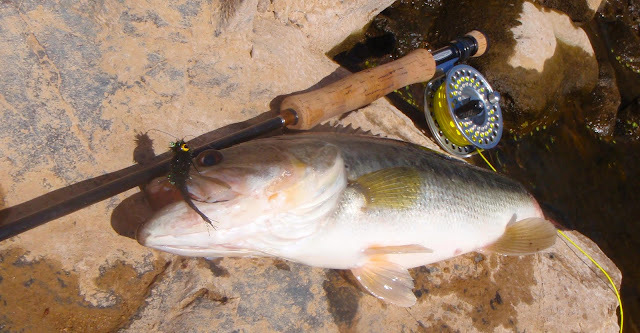 A river shoals largemouth will kick the stuffin's out of an equivalently sized pond bass, any day, probably due to the regular exercise of fighting currents. There's bigger fish down there, but this a good start for the season and a fine indicator that the larger bass have not all been washed into Lake Jordan by this winter's regular flood conditions. Don't let the pictures here fool you. It wasn't as pretty as they make it appear. They must have been taken during the only two minutes of sun and blue sky that I experienced all morning. I look forward to when they are typical, though, and it shouldn't be long. And then, the big boys come out to play. Nice write-up. I went Saturday 3-20 to check out the Haw. I'm from Brevard and miss smallmouth bass, but I caught only one bass and it also was in the 18" range and fought great. Looking forward to more to come. Nice fish and that sure looks like a pretty stretch of river. Thanks for sharing Mike. So little time and so much water! Nice big bass from the Haw!!!! Went to Wilmington for Easter and fished my in-laws stocked retention pond 2 days. I caught 12 Largemouth Bass and 6 Warmouth. The largest bass was 1/2 pound, I could not make the big boys rise up - maybe try something larger next time.